For almost twenty years, saxophonist Joe Lovano and trumpeter Dave Douglas have been prime moving forces in the jazz scene, their paths crossing often on stage and occasionally on record. Douglas appears on Lovano’s 2001 Blue Note album Flights of Fancy: Trio Fascination Edition Two and they overlapped as members of the SFJAZZ Collective for three seasons during which the band performed the repertoire of Thelonious Monk, McCoy Tyner, and their mutual touchstone: saxophonist and composer Wayne Shorter. However, the two had yet to find the “proper balance of personnel,’ as Douglas puts it, to form a group of their own until they assembled pianist Lawrence Fields, bassist Linda Oh and veteran downtown drummer Joey Baron in 2011. Now, a few years and over 50 gigs later, their band Sound Prints will release their debut Live At Monterey Jazz Festival on Blue Note Records. The band is fueled by a desire to push the boundaries of their music as far as they can stretch, similar to the expansive role Shorter has played in jazz since his debut with Art Blakey’s Jazz Messengers in 1959. Shorter quickly gained a reputation as a brilliant soloist and composer built on the outstanding recordings he made for Blue Note between 1964-1971, as a member of Miles Davis’ landmark ’60s quintet, and as a co-founder of popular fusion band Weather Report. At 81 years old, Shorter continues to blaze a trail, as exemplified by his searing, GRAMMY-winning album Without A Net which marked his return to Blue Note in 2013. In the summer of 2011 Sound Prints opened for Shorter’s Quartet on a European tour. They weren’t performing any of his tunes yet but time spent with the legend and his band made a big impact on the group. When Sound Prints appeared on the bill with Shorter at New York’s Town Hall in June 2013 he presented them with the new scores of “Destination Unknown” and ‘To Sail Beyond The Sunset,” two pieces commissioned by the Monterey Jazz Festival. “The music came handwritten – very detailed, very precise,” says Douglas. 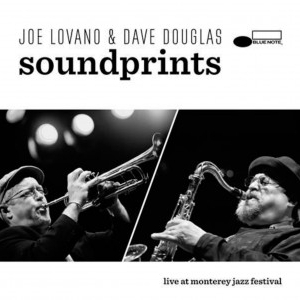 Lovano’s “Sound Prints” opens the album with a trumpet flare by Douglas answered by Lovano. The two horns trade thoughts over a stop-and-start interchange, tossing lines at each other while the rhythm pushes and flows. Following a furious outburst from Baron, Oh and Fields join him in a slinky accelerating chorus leading into the return of trumpet and saxophone. Pianist Fields’ rolling lines and block chords over the drum and bass set the stage on Douglas’ ‘Sprints,’ the longest track on the album which rides over a shifting rhythm with trumpet and saxophone grabbing hold of the melody and quickly giving way to Lovano’s inspired and jagged solo. Lovano’s tenor eventually downshifts over a walking bass, the rhythm steps back and quickly speeds up again setting the pace for Douglas’ hard blowing solo which culminates in direct quotes from Shorter’s “Footprints” first heard on his Adam’s Apple Blue Note LP in 1966, later on Miles Davis’ Miles Smiles. Fields’ piano solo artfully rides the pulsing rhythm before the horns return, shifting the tune into a lower gear and a graceful end. Shorter’s works appear in the center of the album. “Destination Unknown” starts with bassist Oh before the two horns enter from different directions until they introduce the melody in unison, stretching intervals as both head off into their own directions. The rhythm subtly anchors the tune while the horns lay back and Fields solos with tastefully scattered lines. Lovano says, “Lawrence is one of the few young pianists who plays with a lot of feeling, not just virtuosity.” As his solo ebbs, the horns return to bring the piece to an end. On the second Shorter work, “To Sail Beyond The Sunset”, Douglas’ opening line is answered conversationally by Lovano before they play a unison theme and the tune moves into a slowly loping support for the trumpet. The tempo quickens and slows under both horns, then a deceptively spare solo by Fields. The horns return with a restatement of the melodies, leading to bassist Oh’s most prominent solo on the set, played over delicate piano and percussion. “Linda is a very dramatic, swinging player,’ states Lovano. ‘She and Lawrence are very aware of the music swirling around them, not afraid to leave space.” The horns swagger in with a return to the theme. Lovano’s 1-minute 34-second tune “Weatherman” brings to mind the compact melodies of late 50’s Ornette Coleman and Don Cherry. It quickly morphs into the swing and urgency of Douglas’ “Power Ranger” whose theme is tossed back and forth by trumpet and sax until Douglas takes off for the first solo. When Lovano takes over, the rhythm stops and starts before he takes flight. The tune then becomes quiet for another solo by Oh, starting slowly but building quickly as she and Baron toy back and forth, leading to Baron’s solo. His drums anchor the set, pushing and flaring as needed. Fields brings the tune around and the two horns jump in to repeat the theme, talk to each other and tie it up.